WordPress is one of the easiest solutions to set-up a blog free and you can earn as much as you want from this blog by Affiliate Marketing. Affiliate marketing sounds so simple. Just find a program, sign up, grab a link, and make money. But as with child rearing, telling a joke, and golf, it seems that it should be a lot easier than it really is. Today I have listed best free wordpress affiliate marketing plugins for your WordPress site help your users to simply become affiliates, send you referrals, track their clicks and sales and get paid while you do. So we want to try our best in suggesting you the free affiliate marketing wordpress plugins which might be useful and worthy of your time. These plugins help you to make money from your blog quickly and easily and also helps your blog visitor to find your affiliate product easily. If you like our art collection, so check out these other posts will interest you too: WordPress Free Post Thumbnail Widgets, WordPress Photography Free Themes, Political WordPress Premium Themes and Support Chat Plugins for WordPress. ThirstyAffiliates empowers website owners with the tools they need to monetize their WordPress website with affiliate marketing. It lets you administer your affiliate links, assists you with inserting them into your posts, pages and comments and gives you a central location in WordPress to manage all of your affiliate links. The ProductWidgets plugin automates your affiliate marketing process by analyzing your content and displaying matching affiliate products to your visitors. The whole process is fully automated and happens behind the scenes. This suite will give you everything you need to easily start making money with your blog. Display a product within your post or page to easily show visitors products. 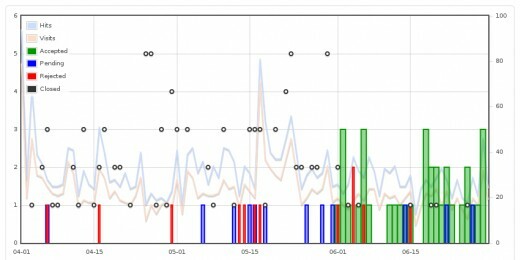 Contains a link-optimizer and link-affiliator to easily monetize links already in your blog. Search, select & import affiliate products into your WordPress website and display those products using the most popular eCommerce platform, WooCommerce. Simply use our powerful search form to find the products you want to promote, then click to import those products directly into your WooCommerce store. eBay Feeds For WordPress allows you to quickly and easily place feeds from the eBay Partner Network into your WordPress blog. These can easily be embedded into posts, placed as widgets or inserted into the themes – flexibility is huge. WP Affiliate Manager can help you manage an affiliate marketing program to drive more traffic and more sales to your store. Affiliate Marketing is the fastest growing advertising method and it is very cost effective. This plugin facilitates the affiliates recruitment, registration, login, management process. Affiliate marketing is a type of performance-based marketing in which a business rewards one or more affiliates for each visitor or customer brought by the affiliate’s own marketing efforts. This Affiliate plugin creates a banner to display ClickBank keyword-sensitive graphic affiliate ads with ebook covers on your WordPress blog. 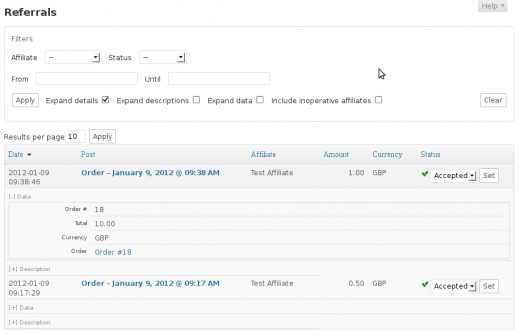 The Affiliates plugin provides the right tools to maintain an Affiliate Marketing Program. With unlimited affiliate program management tools available on the back end and a set of shortcodes to provide Affiliates information on their performance on the front end, there is everything you need to start an affiliate program. The plugin allows you to set a referral (commission) rate so that your affiliates get credited with a referral based on a percentage of each sale’s total net amount. Affiliates is an outstanding platform that helps to boost sales through your affiliate program and is the ideal affiliate solution for WooCommerce. The Ashadee plugin for WordPress allows Malaysian bloggers to automatically add related ads from the Ashadee affiliate network. Based on the keywords you use in your content, ads are highly targeted and varies according to the page or post. The plugin is small and easy to use. 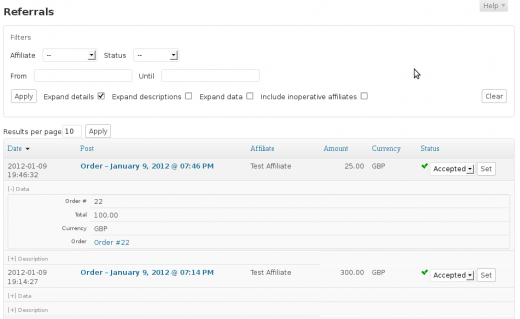 With this integration plugin, referrals are created automatically for your affiliates when sales are made. The plugin allows you to set a referral (commission) rate so that your affiliates get credited with a referral based on a percentage of each sale’s total net amount. The PalTip plug-in helps you get the most out of your blog post links and product reviews with zero effort. The PalTip plug-in locates links you have included in your posts and automatically converts them with a new PalTip affiliate link. This new affiliate link lets you earn money from the traffic you generated. The Daisycon affiliate marketing XML product feed importer is a plugin that helps non-technical affiliates to use Daisycon XML product feeds. This plugin is available in Dutch, English, French and German. With the plugin you can easily load Daisycon XML product feeds in your WordPress website, where after you can search in the feeds. Easily integrate your AdWork Media Content Lockers & Link Lockers into your WordPress site. This plugin will allow you to easily setup AdWork Media Content Lockers & Link Lockers on pages and posts of your choice.